Hansel and Gretel have found a gingerbread house - but it's a tiny one! spih: Aw, nice. I love Gretel's red version outfit. Watch out for the witch! Oh man, I'm not sure how I feel about the body, does anyone own it? How does it look irl? @Kima Your Lana is just darling, the oscardoll eyes compliment her faceup and body colors so perfectly. (The centaurs are amaaaazing) I'm smitten, she's so photogenic!! Would anyone that has a Tiny 20 be willing to share a little about their posability? The website photos look great, but since the legs are strung separately from the rest of the body I was wondering if detracted from anything? I would also love to see owner photos of the old and new bodies at some point, too. The differences seem so small but I wonder how the posing improved... it was already pretty good (imho) so I'm still curious why they changed it! Hi folks! Sorry if this is the wrong place to post. Can anyone share how easy it is to swap hands for Tiny Delfs? 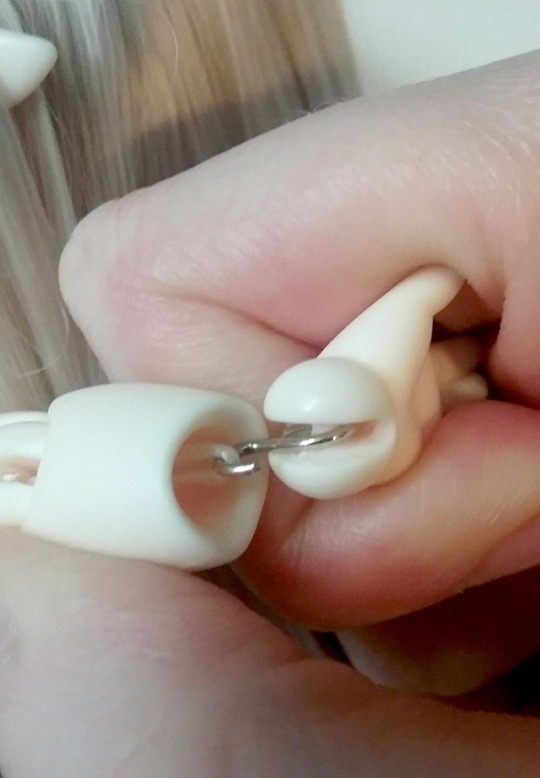 I have a Luts Model Delf whose hands are on hooks so it's super easy, but when I look at pictures of the replacement hands for Tiny Delfs it looks like they are on rings. Are they strung through the arms? I'm smitten with Jack and I'm just trying to figure out if getting the extra hands makes sense. I know if they are a pain to switch I won't ever do anything with them, lazy dolly mom that I am. @schmooples It seems like the right place to ask, imho! Like lacybug said, they have S hooks~ I snapped a picture for you! (Since I had one sitting on my desk in front of me) I don't think it'd be too hard to swap hands, maybe just a tiny bit more work because of the small hook size- but I definitely think it'd be worth extra hands. Also, 100% recommend Jack sculpt! The pouty cheeks are just the best. @Lacybug , @Beedalee thank you for the responses and picture! I think I will get the extra hands then, I just was afraid I was going to have to re string every time I wanted a swap. @AnnaDolly Do you have a picture of her without her wig? I have a realskin brown Hansel and I haven't noticed any difference in his aging skin. (Though, he's only from 2017.) The difference in color could be from sealant. And the white sealant on her legs could be just from aging or from temperature and humidity changes. She's adorable and looks super cute in her little pajamas! emrys helped decorate the tree. @auntbear What a cute little photo! I love seeing tinies decorating trees. @Mushoom Congrats!! I'm sure you can't wait to get your little mermaid home!